Some people grow up learning to physically hit, shake, punch, shove and do other acts of physical violence to others when upset. Many do these things when they feel attacked physically, verbally or any other way. Others become physically violence-prone when they get frustrated and others when they are mad. Still others strikeout physically when they feel threatened and some others when just about any negative feeling occurs. Many males, especially, have been well trained to physically ‘hit back’ when they feel ‘hit’, even though what hit them was only words. No small number of females do the same thing. Then there are those who ‘hit’ others in playfulness but they may do it too hard, too often, too much, in the wrong way, or in a wrong place or wrong time for others to ‘playfully’ accept it. All of this can have very anti-love effects and, therefore, can have quite a destructive effect on a love relationship. One common reaction is to tell the person who is acting physically rough or violent to “stop that”. Be aware that quite frequently it does not work to tell someone what not to do. It may only work to tell them what to do. Saying things like “don’t hit, stop hitting, don’t ever hit him, or her, or me again”, etc. for long-range results often is almost useless. It works far better to tell a person what to do instead of what they’ve been doing. Until someone knows ‘what new behavior to replace an old behavior with’ there is a high likelihood that they will, by practiced tendency and habit, return to responding with the old behavior. Until you know a replacement behavior you likely will keep doing what you’re used to doing until you learn what to do instead of what you have been doing. It sort of is like being told what not to do creates a vacuum into which something will rush to fill that vacuum, just like in the physical world. The easiest thing that fills that vacuum is the behavior you are used to doing. So, what’s going to replace hitting or a physically violent activity that we want to stop? The answer can be becoming trained, practiced and committed to a ‘Touch Only with Love’ way of acting toward your loved ones and perhaps others. This is not the only thing but it is a tool which can help a lot. This tool can be made to work quite well with both children and adults. Couples, family members and friends who get into physical fights with each other can commit to a ‘Touch Only with Love’ strategy to replace their physically violent reactions to one another. Making a commitment to such a strategy often is a tipping point for creating a very important improvement. Why does a person, who supposedly loves another, sometimes try to physically hurt or harm that person? Here are some background factors about that. Siblings who physically fought a lot when young are in danger of suddenly striking their spouses when feeling attacked. Parents who were struck a lot as children are in danger of reactively striking their children, especially when they get tired, stressed or angry. Those who grew up around adults who physically abused those around them unfortunately may have been subconsciously programmed to do the same. Those who grew up in neighborhoods or other environments where there was a lot of physical violence are more likely to be physically violent. Growing up in any environment in which physical violence is praised, honored or seen as the right thing to do later may endanger subsequent loved ones to physical abuse because rewarded behavior tends to continue or re-emerge. Children who are not corrected for being physically violent in their youth might have been accidentally reinforced for being violent and often are more prone to become physically abusive in their adulthood. The chronically immature can sometimes have similar permission giving, subconscious programming for violence. As you can see, many people are programmed subconsciously to have a tendency toward being violent. However, reprogramming is very possible and committing to the ‘touch your loved ones only with love’ approach can help accomplish that reprogramming. With commitment, and training, and sufficient practice you can make a new habit dominant over an old one, therefore, replacing it. ‘Touch only with love’ can be your new habit. Adolescents who get into physical fights can be helped to form a ‘touch only with love’ habit by judicious use of rewarding them for the desired behavior. Children can be shown and taught that soft, more gentle touches, hugs, etc. are the desired and rewarded way to touch each other. Fighting families can draw up and agree to help each other abide by ‘touch only with love’ contracts. Individuals who want to get past physical violence tendencies can commit to and then through role-playing practice a “I will only touch others with love” behavioral strategy. I’m not saying reprogramming yourself is easy, I’m saying it is very worth the effort. When you feel angry, frustrated, impatient, stressed or any time you might feel like lashing out physically toward a loved one say to yourself something like, “I’m not going to let my old violence training control me. I’ve committed to ‘touch only with love’ so I’m going for a walk around the block to cool down” or “I’m going to take a couple calming breaths to relax some of this inner tension” or “I’m going outside to throw ice cubes at a wall to let off some steam” or “I’m going to the bedroom to beat on a pillow until I simmer down. And when I return I’ll be more able to handle this and touch only with love” – or say something that works for you. Amazingly this usually changes the whole dynamic of the interaction and makes room for positives. You and your loved one both can benefit from your work to replace the old habit with one dominated by ‘touch only with love’. A commitment to or a contract between people to touch only with love has helped warring couples break their violence cycles. Role-playing new behaviors in scenarios where you have previously struck someone, starting with reminding yourself that you’re committed to ‘touch only with love’, has helped a lot of people. Adding a ‘re-direction of your actions’ strategy to the ‘touch only with love’ approach often is wise. However, you really must work at remembering to tell yourself “I’m committed to touching loved ones, (others, etc.) only with love”. Families and couples who contract with each other for a “touch only with love” agreement can plot out rewards for living up to their pledge, and also penalties for relapses. A lot can go very wrong when people get physically aggressive, especially to a loved one. Reminding oneself that in the modern world relationships involving physical abuse and violence usually end poorly and sometimes end tragically. There is a lot of evidence pointing to repeated physical violence in a relationship almost inevitably leads to the relationship being either severely harmed or destroyed. Violence in couple’s relationships is extremely prone to escalate causing real physical damage and sometimes even death. Also with escalation there is the likelihood of lengthy, complicated, costly, judicial system involvement and possible imprisonment. Increasingly parents who physical punish their children, much like they themselves were punished, are being found guilty of physical abuse and often have their children taken from them as well as facing possible imprisonment. In lesser cases having to attend parenting classes or parent guidance counseling also may be involved. So you can see there are lots of good reasons to develop a ‘touch only with love’ approach to those you love. The very best reason to ‘touch those you love only with love’ is because that is the loving thing to do. There are some other important concepts to understand which provide a foundation for understanding the importance of this tool. Some people mistakenly think love causes or even justifies physical violence. “If I killed her doesn’t that mean I really loved her?” is the infamous quote exemplifying an enormous, wrong understanding of love. ‘Spare the rod and spoil the child’ is another one which has been used to justify physical abuse of children for ages. The truth, according to the scholars in ancient times, is that the rod referred to was used to gently guide and never hit sheep, goats or cattle. We now understand that physical violence toward our loved ones does not come from love. That’s because healthy, real love fundamentally works to motivate us toward being protective not harmful to our loved ones. Only false forms of love involve people being seriously hurtful or harmful to a loved one. (See blog entries concerning “False Forms of Love”). Thus, ‘touch only with love’ works as a tool for enacting and ensuring healthy, real love. This tool can be used in a number of ways. 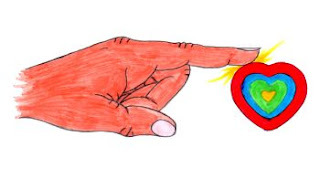 An individual can just dedicate his or herself to ‘touching only with love’ and that usually means touching softly, gently and with a love-centered ‘heart’ attitude (see blog entry “Love Centering Yourself”). Any group of people (family, couple, friends, etc.) can contract with each other that their way of relating physically to one another will be governed by the rule of ‘touch only with love’. Any group of people can agree to encourage, praise, compliment and thank each other every time there is a difficulty in which they adhere to their pledge to abide by this rule. If penalties for violation of the rule are involved they need to be rendered via self-denial or deprivation of something, and not anything involving physical pain. In rare situations some loving touch could conceivably require restraining someone from self harm or from harming another. In some cases other strong touch actions might be loving but probably not the purposeful, selfish harming of another. People who more or less automatically turn to violent physical action when they feel frustrated, unfairly treated, betrayed, jealous, misused, maligned or otherwise demeaned often find this tool especially useful. ‘Touch only with love’ can be coupled with other anti-physical violence tools and strategies for a more comprehensive approach. Is there always love in the ways you touch your loved ones?